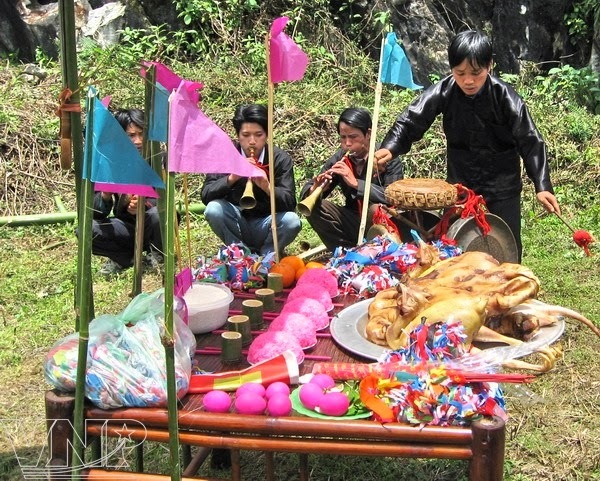 Every year on the snake day of January according to lunar calendar, the Giay ethnic group in Ta Van Commune, Sa Pa district, Lao Cai Province organizes the Roong Pooc (going to the field) Festival to pray for bumper harvests, peace, prosperity and clement weather. Have many exciting activites, especially Con - throwing. The firs, people plant a Con pole, over 20m high. The game activities start with the Con-throwing, the shuttlecock goes through the center of a paper-covered circle on top of the Con pole. The men’s group (symbolizing the sun) is always the winner and the women’s group (symbolizing the moon) pretends to be the loser. This means the whole village will have good harvests throughout the year.After the Con - throwing game, Giay ethnic people begin a new crop. 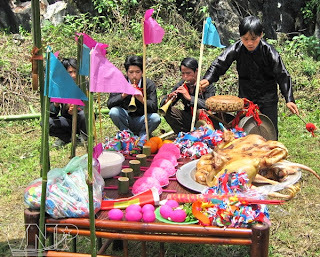 Originally, this festival is the tradition of the Giay people; however, recently, it has been spreading and become the popular festival for ethnic minority groups living in Muong Hoa Valley. People start to go to the festival very early in the morning. There are the H’mong from Hau Thao, Lao Chai, the Dao from Ho Village, Phung Village, and many visitors from Sapa town also come to take part in this festival.